I’ve been a fan of The Other Guys for a while now. I first had their wines back in 2006 when I was just exploring all that my local wine shops had to offer. There are 5 wines made under the Pennywise label – Pinot Noir, Chardonnay, Merlot, Cabernet Sauvignon and Petite Syrah. I’ve had the Petite Syrah and the Pinot Noir. The Pinot is what we opened as a pre-dinner sipper. You must understand that we are pinot lovers, and we typically don’t spend our mortgage money on cult pinot,s much to the chagrin of Rex Pickett’s character in Sideways. We are looking for “affordable and delicious”. That is what you will find in the 2009 Pennywise Pinot Noir. The Other Guys is a wine producer run by one of California’s oldest winemaking families. 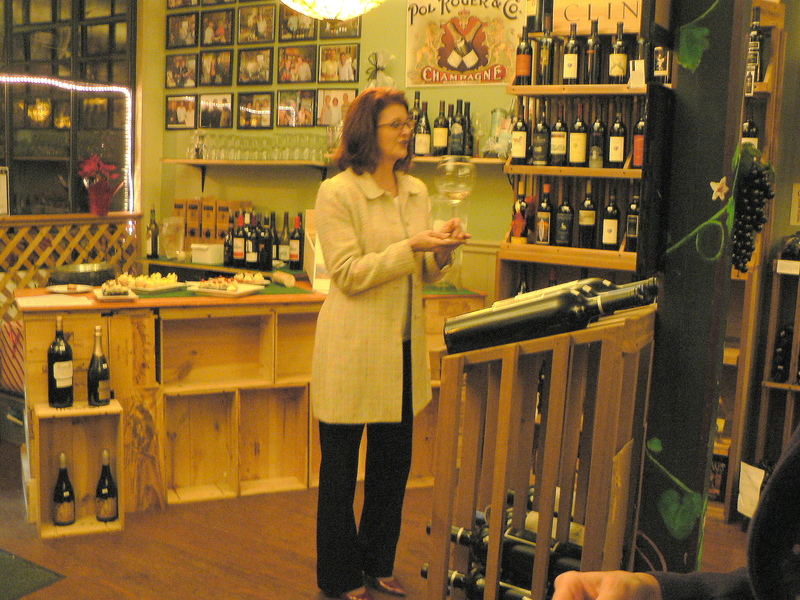 August Sebastiani is a 4th generation wine maker, and president of TOG. They’ve been doing this for a while, and I haven’t had a wine from TOG that I didn’t like. The Pinot Noir is blended from the grapes of several vineyards and that blending provides a flavor profile that is pleasing to the nose and to palate. Cherries and a the slightest smell of cotton candy greet your olfactory sense, while strawberry and a hint of vanilla add to those aromas on your palate. Its smooth, with mild tannins and a lingering finish. This is an easy drinker, but will pair well with burgers or chicken for your mid-week dinner. I could easily pair this with a chicken pot pie, or a homemade meatloaf – as well as a more upscale meal. Even a little acidity wouldn’t bother this wine. It is (usually) widely available in Cleveland wine shops and comes in at a pleasant $10.99 in our area. On another note, since I mentioned Rex Pickett – if you enjoy a good novel about wine, pick up Sideways, or the new sequel Vertical. Excellent reads. You can click on the images below for more information about the books. Posted in reviews, tasting notes, Wine of the Week and tagged Pennywise, Pinot Noir, Rex Pickett, Sideways, The Other Guys, Vertical. Bookmark the permalink. We picked up a new bordeaux the other night. 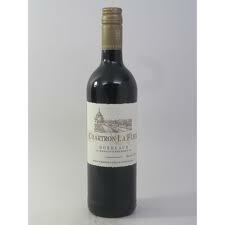 The 2008 Chartron La Fleur Bordeaux – 70%/30%, Merlot and Cabernet from Maison Schroeder and Schyler. The man wanted french wine for dinner, so I went hunting for a new appropriate recipe – it had to include butternut squash, since there was one glaring at me to be cooked from the corner of the produce pile. Velvety and berry on the palate, this wine has balanced tannins and acidity. 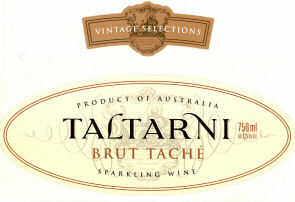 Its not a cru – but it is a great blend and budget friendly sipping. High QPR wine at $11.99. Preheat oven to 350 degrees F (175 degrees C). Coat a roasting pan with the olive oil. Place the squash and onion in the pan, and season with salt, pepper and sage. Roast 30 minutes, or until squash is tender. Bring a large pot of lightly salted water to a boil. Place penne pasta in the pot, cook for 8 to 10 minutes, until al dente, and drain. In a large skillet over medium heat, cook the tenderloins, covered in italian seasoning, until done. Remove chicken and cut into bite size pieces, then transfer back to your skillet. Transfer the cooked squash and onion and the cooked pasta to the skillet. Gradually pour in the cream. Season mixture with sage. Continue cooking until heated through. Mix in garlic. Transfer to a large bowl, and toss with balsamic vinegar to serve. I realize you may look at this and say OMG, that’s a LOT of balsamic. You might even think that again as you are portioning it out into the bowl. I know I did, and it scared me just a bit. Trust me when I say that it does not taste like its overly vinegary. The balsamic brightens the recipe substantially. Also, you only want to turn the squash once when its baking, and get it out of the oven when its just done, otherwise you get a squash that looks less appetizing than it tastes. This wine was pleasing, balanced this dish well, and I recommend them together, separately, or paired with others. Posted in pairings, reviews, tasting notes and tagged bordeaux, chicken, french wine, recipes, squash. Bookmark the permalink. 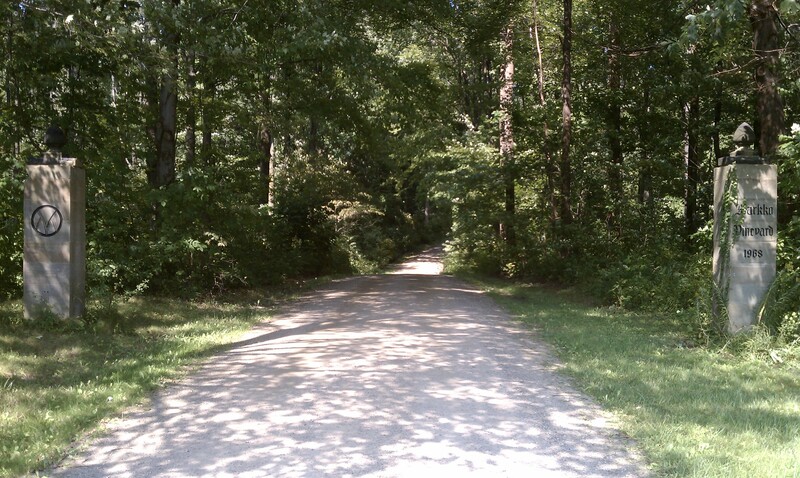 This is the way we usually choose a place for dinner. And that’s the end of it. No mention of what kind of food – most any place we go in Cleveland is going to be good stuff. I knew the wine list was good, and thin crust gourmet pizza just sounded yummy. When I say we went early, it was probably 6:30pm when we arrived and there were only a handful of people in the front room or in Bar Cento itself. The server was prompt and helpful – even if she did talk to my partner about the wine selections as if I wasn’t sitting there. Bless her heart. 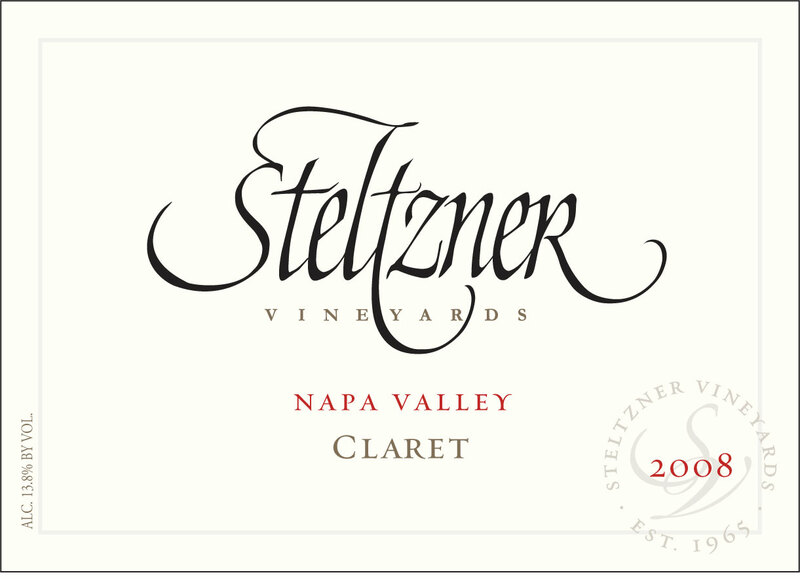 Our wine selection was Steltzner Claret Bordeaux ‘08, at $35. A blend of 65% Cabernet Sauvignon, 20% Merlot and 15% Cabernet Franc – its a pretty big wine, with well balanced tannins. Nice cherry, cinnamon and clove on the palate. Its spent 22 months in Mixed French Oak, so this is oakier than I usually like. 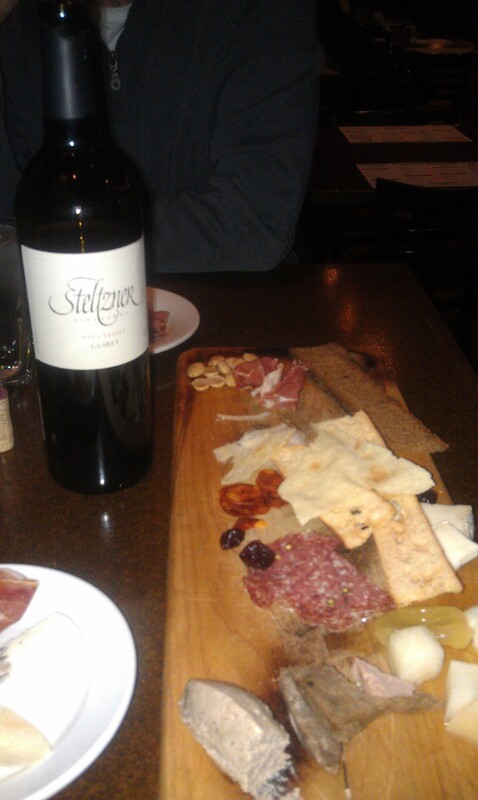 But with our Big Board – charcuterie, cheeses and house pickled vegetables for $18, it was an excellent balance. We loved the 2 different patés on the board and the cheeses were very well selected. Nothing commonplace. I was impressed with the upper end of their wine list. Their higher end wines are less than 2x retail. For restaurant service, and comparable to some places in town… I was impressed. The lower end isn’t quite the deal on pricing, but nothing was in my “are you kidding me?” range. Chef Adam Lambert was out and about in the dining room. One of the things that really stood out was that Chef was outside the kitchen talking to the servers and taking one last look at each plate that went out. It was obvious that quality and presentation were his highest priorities. Final Comments: Nice wine list, great service, food served with the highest quality in mind. We’ll go back. And if you are looking for a nice meal with your honey, it makes the grade. 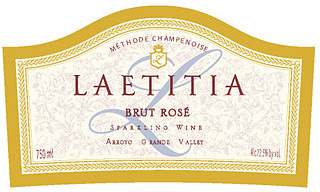 * Cuvée – a blend of several grapes, versus a single varietal. For MissWineOH, this is a blend of topics that will occasionally pop up when a single category is not appropriate. Posted in pairings, reviews, WineOHs Cuvée and tagged Bar Cento, CAwine, Cleveland, Napa Valley, Ohio City, Pizza, Wine Bar. Bookmark the permalink. We opened this one on a random evening – pairing it up with Frank’s great spaghetti sauce over linguine. One of these days I’ll learn to make pasta… but until then, the box works out pretty well. From the CHÂTEAU DE JAU in ROUSSILLON, FRANCE – built in 1792, and nestled in the southernmost foothills of the Roussillon slopes of the Corbières Mountains in French Catalonia. The estate produces an array of wines, including three very affordable Le Jaja de Jau varieties – a syrah, a sauvignon blanc and a syrah rose. 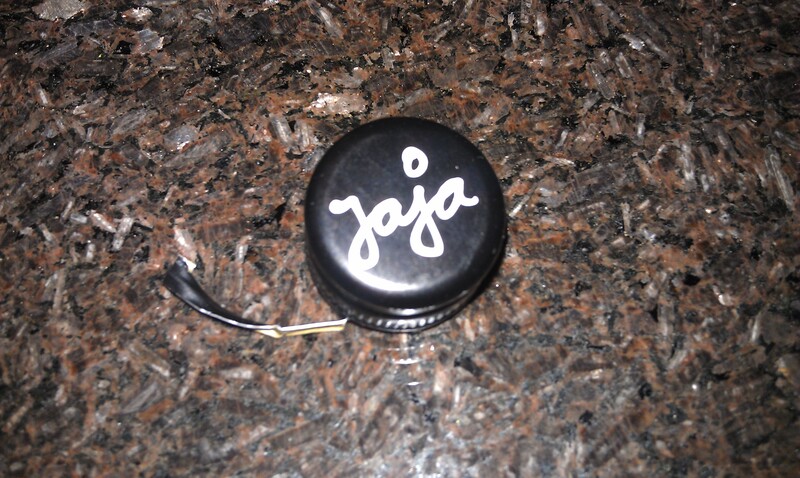 Jaja is a slang phrase for the region’s delicious full-flavored, everyday wines. It is the house selection in local bistros and restaurants, and that’s a great descriptor for this one. A structured but uncomplicated Syrah, it’s easily paired with your everyday chicken, pasta or beef dishes. 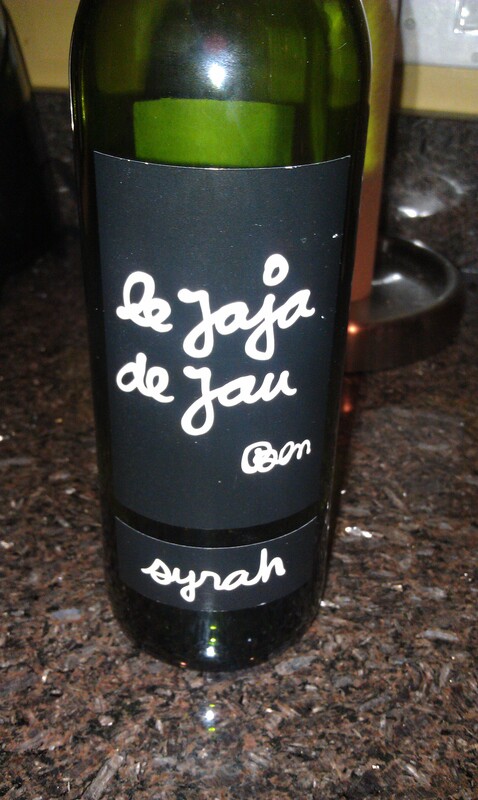 Anything with a little bit of kick, or a tomato base, will do well with Le Jaja from the vineyards of the Vin de Pays d’Oc. I will give you the warning to be careful with the screw cap. This one bit in as we removed it. I’d recommend opening it up with a towel or some covering if you don’t want it to draw blood or leave a scrape. The metal band shredded before we got it loosened up. Other than the problem with the cap, the wine was a good, drinkable Syrah. Well balanced tannins and acid, a hint of raspberry on the palate. We’ll be keeping a few bottles of this one around. Every wine lover with a budget looks for pleasant, drinkable wines that don’t break the bank. This one comes in at $8.99 from World Market. 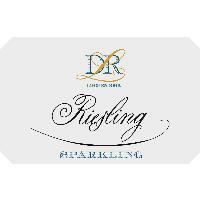 Follow this link for other places to buy this wine. For another opinion on this wine, see what The Reverse Wine Snob had to say. Posted in Wine of the Week and tagged everyday wine, french wine, Vin de Pays d'Oc, Wine of the Week. Bookmark the permalink. On a beautifully warm and sunny day in January MissWineOH heads to The Olde Wine Cellar in Olmsted Falls, OH for the first Wine and Cupcakes event for 2012. 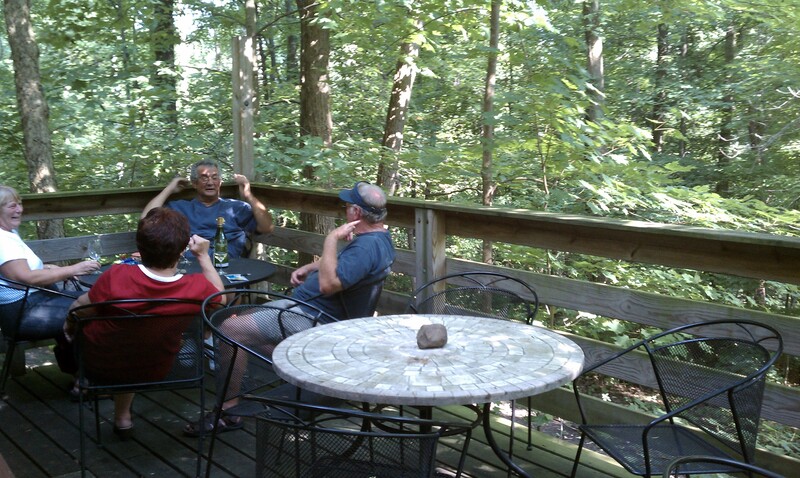 By the time we arrived to prep and set up, it had turned into a day out of the Wizard of Oz (think “Auntie Em… Auntie Em” – the wind and rains were so strong…) Fortunately this did not deter our guests and we all gathered at 6pm for the first taste. Love those big wine glasses! 2010 Chateau Belair Moustet White Bordeaux (FR) paired with an Olive oil and Peach Cake with Herbed Marscapone icing from Indulgence. Simple and fresh, cleansing citric flavors make it a decent food wine at 12% alcohol. Budget friendly white wine at 9.99 retail. If you are making a dish with clean, but complex flavors (like a chicken with a sauce, salsa or herb crust) this wine will not compete with your food, but provide a pleasant citrus compliment. 2009 Bonny Doon Albariño Ca’ del Solo Estate (CA) paired with White Chocolate Wasabi and a plum sake cake base from Indulgence. This Spanish grape has become popular in vineyards throughout the US. California, North Carolina, New York and Virginia are growing it increasing numbers. You will see a difference in the grape depending on its origins (or terroir). Ca’ del Solo is one of Bonny Doon’s estate vineyards. They farm using Biodynamic® practice, exceptionally light-handed, with with minimal intervention and manipulation. This winery is known for putting EVERY ingredient on their labels – not something you see on many wine labels. 2009 Root 1: Pinot Noir (Chile) paired with a dark chocolate cake with buttercream bacon frosting from A Cookie and a Cupcake. We always pair our Pinot Noirs with bacon, because EVERYTHING is better with bacon… and this lively budget friendly wine is no exception. Fermentation in barrels and stainless steel tanks, and malolactic fermentation with native yeasts. Aged for 10 months: 70% in French oak barrels, 30% in tank. TASTING NOTES: Deep ruby in color with bright, intense aromas of cherry and raspberry, with hints of vanilla. Soft and mouthwatering on the palate with medium body, and ripe red berry flavors. Lively acidity coupled with elegant, soft tannins and a long and clean finish. This is known as a pre-phylloxera wine. Phylloxera vastatrix (its Latin name) is thought to be indigenous to the eastern United States, and the thick, strong, native American rootstocks are reasonably resistant to this parasite. Much more vulnerable to phylloxera is the vitis vinifera rootstock – a species native to Europe and Central Asia and responsible for a majority of the world’s wine production. In the 1860s, vine cuttings from the eastern United States transmitted phylloxera to Europe, and eventually most of the vineyards in France and many in other parts of Europe were totally devastated. The parasite eventually spread, causing grave problems in California and other parts of the world including Australia, New Zealand, and South Africa. The solution was to graft Vitis vinifera vines to native American rootstocks, a remedy that worked for the better part of a century. There are a few places around the world that phylloxera has never invaded either because of the remote location of the vineyards or the inhospitable soil makeup. Many of these vineyards are planted on Vitis vinifera rootstock. Some parts of Australia, Argentina, Chile are phylloxera free as are island vineyards on Crete, Cyprus – Root 1 Wines are one of those original, ungrafted rootstock vineyards. Deep purple in color, the 2008 blend shows aromas of berry spiked with cinnamon and nutmeg. Raspberry/strawberry flavors present in the mouth, which slowly meld into cedar, dark plums, and molassas. bright acidity. This wine pairs well with italian, sausage or red sauce dishes. We’ve paired it with a cake of many flavors to show you the versatility of the wine. I can also see pumpkin easily with this easy drinking blend. Currently (1/17/12) not available in the store due to overwhelming popularity. 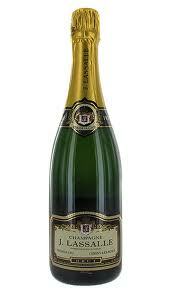 But it can be found for about $11.99 retail and will be available at The Olde Wine Cellar in mid-February. 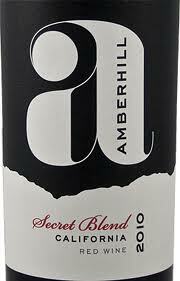 2010 Amberhill Secret Blend (CA) paired with Roasted Garlic with Smoked Gouda cheese icing. 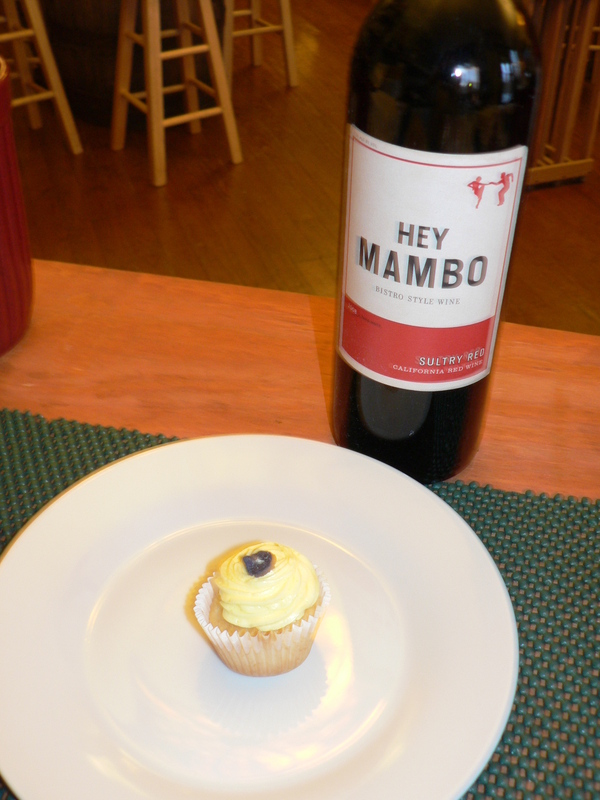 This cupcake combination always strikes folks as strange, until they taste it and put it together with a great wine. A Cookie and a Cupcake filled this one with a bit of roasted garlic buttercream. A lovely little surprise on the inside of your bite. The 2010 California Secret Blend Red Wine is a mix of varietals that delivers a fruit-forward style. Expressive aromatics of cherry and strawberry blend with subtle notes of cedar, pepper and espresso bean. A versatile blend like the Amberhill can pair with most savory meals. I pull a lot of the Zinfandel and Syrah notes out of this one, so garlic and smokey gouda would be up there in the flavor profiles. InZinerator is blended with Zinfandel, Syrah and port varieties. New world extraction methods and richness with old world acidity and structure. Scott Harvey has been the winemaker at Santino Winery, and then partner, winemaker and president of Folie a Deux Winery. He opened Scott Harvey wines in 2004. Scott Harvey wines gained some notoriety when the InZINerator was banned in the state of North Carolina and at ComicCON because some thought the Superhero label would encourage minors to drink it. Read more about that here. 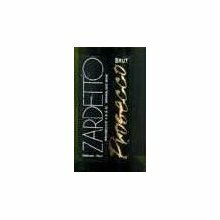 The 2008 is a blend of – 78% Zinfandel 16% Syrah 5% Mixed Port 1% Barbera – the 2007 notes are not available, but the blend is similar. A great Zin for $14.99 retail. This blend was crowd sourced. Scott, an active member of the Woot community, asked the InZINerator fans for input on this wine. We all had a great time at #WineandCupcakes. 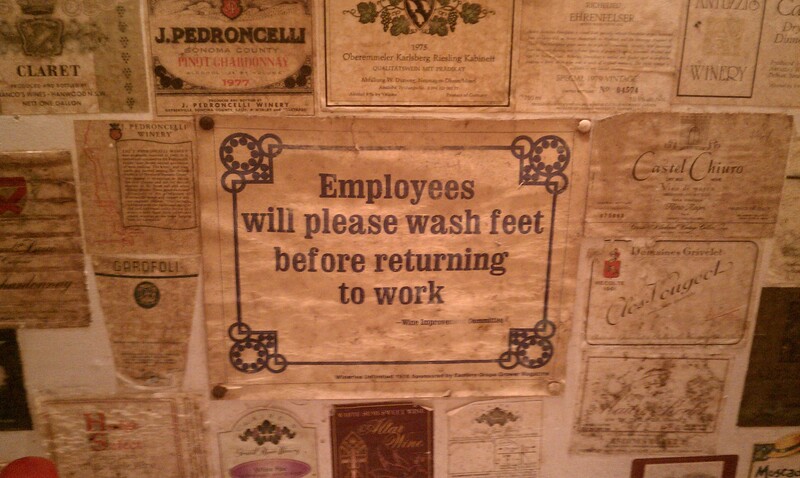 We’ll be back at The Olde Wine Cellar on March 22. And on the east side in February. Many thanks to @indulgenceCLE and A Cookie and a Cupcake for providing amazing cupcakes, and @theotherguys for getting me out of a wine jam. Incredible customer service from these three companies, and I can’t thank them enough. 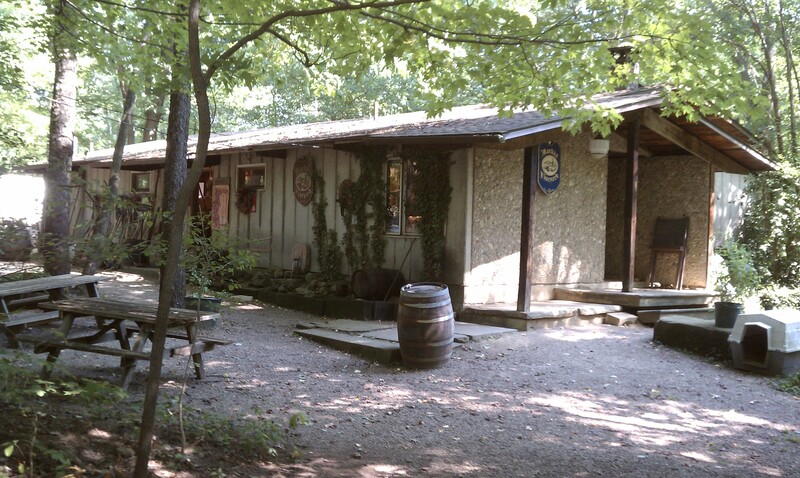 The Olde Wine Cellar is THE place to get small volume wines and they do great casual wine tastings on Friday and Saturday nights. If you attended this event, please leave any comments or feedback. We’d all love to hear what you thought! 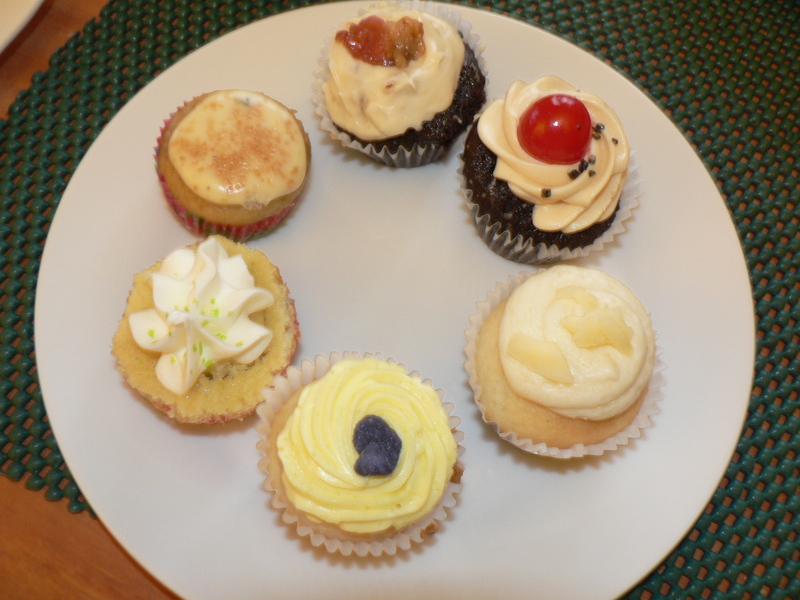 Posted in pairings, tasting notes, Wine and Cupcakes Notes and tagged #wineandcupcakes, Bonny Doon, Hey Mambo, Inzinerator, Root 1, The Other Guys. Bookmark the permalink.